The Motley Fool (TMF) recently published a column entitled, “The Average American Household Approaching Retirement Has This Much Saved Up.” It’s pretty discouraging. TMF took data from a GAO report that includes the current financial status of households between the ages of 55 and 64. (A link to the report is provided in the TMF column.) They found that 41% of the households in the study had been unable to save for retirement directly though many of those have homes with paid-off mortgages and about a third have pensions. 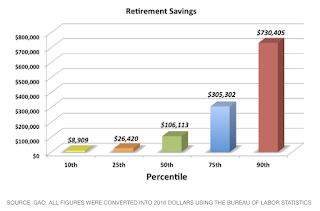 TMF provided the following graph in that column, showing the distribution of retirement savings within that 55-64 age group. Keep in mind that some of the group have nearly reached retirement age while the youngest have another decade or more to save. Ignoring the 41% of households with no savings and considering only the 59% with some savings, the Motley Fool produced the following chart showing median savings of just over $106,000. Wade Pfau’s Retirement Researcher website includes a dashboard that shows the current payout of annuities, TIPs bonds, systematic withdrawals, and other distribution methods. It currently shows the payout for a 65-year old couple from a life annuity adjusted for CPI-U (inflation) with 100% survivor benefits to be about 3.85%. Wade's current estimate for the payout of a “4% Rule” spending regime is about 2.92% (the “4% Rule” is currently a little less than a “3% Rule”). Is My Retirement Plan Protected?